​What Do Those Men Do on Thursday Mornings? ​In August 2016, Pastor McGuire approached me to convene a group of men that were capable of minor church repairs. 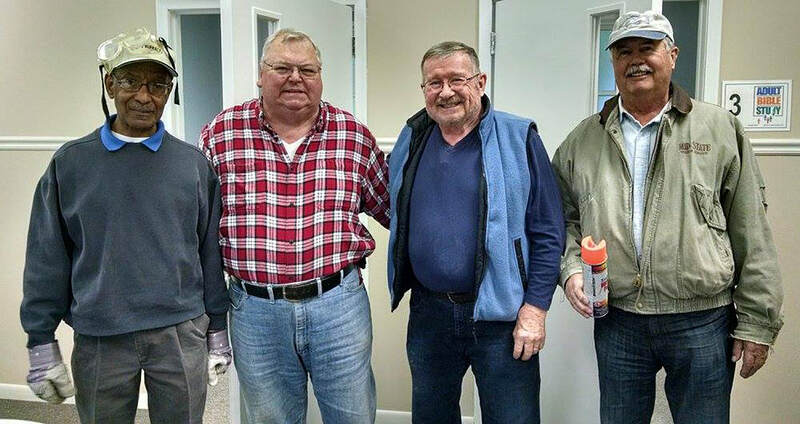 So on Thursdays, from 9 am to noon, CPC has its own crew working behind the scenes to improve and repair our facilities. Yes, we do consume copious amounts of coffee and doughnuts. However, as you read the following list, I believe we can all agree that we are saving our church money while moving forward with some needed improvements. A journey of a thousand miles begins with a single step, and many hands make the work easier. A huge thank-you to the following for their time: Ray Boone, John Dellinger, Mike Hoff, Tom Metzner, Gene Szczepanek, Jack Engebretson, and Bill Ujczak. Furthermore, a special remembrance goes to Pete Disalvo. Replaced the address sign, and the church sign out front. Trimmed tree branches hanging over the church. Replaced the door to Pastor's study. Cleaned the gutters, and repaired the shed doors. Extended downspouts away from building. Replaced hardware in lavatories. Painted the shed. Replaced cement around front entry. Insulated and replaced washers on outside spigots. Installed bulletin boards/white boards, and coat hooks. Installed LED fluorescent lights in children's Sunday School rooms. Added paper towel hanger in kitchen. Mounted AED unit on Fellowship Hall wall. Replaced ceiling tiles as needed. Added outside sensors for boiler room. Replaced kitchen faucet. Installed ice maker in kitchen. Removed unused shower, and created storage closet in men's lavatory. Added concrete patch to sidewalk. Changed the hardware in three doors. Adjusted seals on outside door. Constructed a baby changing table for the Nursery. Replaced light outside the side door with a LED motion sensing fixture. Mounted & stabilized a TV on a mobile stand. and Nursery. Mounted new, solid door for Counting Room. Mounted hand sanitizer on the wall at the beginning of the food line. Traced the electrical circuits to identify which breakers they are on. with the desire to help, and make sweat equity in the future of our church.